The citizens here are no less pleased by the shifting landscape than those you’ve already encountered. Their neighboring forest is all but lost, replaced by a sprawling desert. At least they’ve still got their pond. Do You Feel Brave or Cowardly? The real reason to stop in Moore before traveling on to the Pyramid is not to discuss landscape changes with the locals, but to pick up one of two weapons. 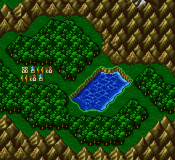 If you explored Moore back in Galuf’s world you found a small shack at the southwest edge of town. It was locked at the time. Now, however, it has been opened. The villagers are afraid to go near it claiming it’s haunted. That’s good for you because they haven’t claimed its treasure. From the shack, walk south into a dense hedge-maze. When you can’t go south anymore turn west and walk a few paces. When you hit the west wall turn south again. If you go all the way south you will find yourself at a dead end. Backtrack a few steps and keep checking west for a passage. Once you’ve found it walk along it gingerly and check for another southerly route. Travel along it until you find yourself in a clearing with a purple-robed mage and two crates. He implores you to make a choice between the two boxes. They each contain one weapon, and you can’t have them both. If you have enjoyed running screaming from countless battles, the Chicken Knife may be the weapon for you. Its base atk is an abysmal 1. However, its atk increases by one point every two times you flee to a maximum of 127. Additionally it raises agi by 5 points. All classes except monks and white mages can wield it. Does it sound too good to be true? The Chicken Knife’s drawback is that it forces the party to flee 25% of the time you attack with it. You can circumvent this drawback. To do so you must have Dual-Wield. You must equip the Twin Lance in your right hand. You must equip the Chicken Knife in your left hand. Because the Twin Lance attacks twice the game forgets to check whether you should flee. If, on the other hand, you have stood your ground as a valiant warrior and fled few or no times, you may wish to choose the chest on the right. That chest contains the Brave Blade. This sword starts with an atk of 150—higher even than the famed Ragnarok sword [140 atk ] that Shinrysu guards. It also boosts str by a hefty 5 points. Unfortunately, each time the party flees the attack power decreases by one all the way down to zero. Another minor drawback to the sword is that without the Equip Swords ability attached, the only characters that can wield it are knights and the freelancer class. With Equip Swords slotted a mystic knight can wield the Brave Blade, enchant it, and wreak havoc on his foes. Which one you choose is based on your playing style and what you think would benefit your team the most. I’m a sucker for power. I usually pick the Brave Blade. I’m leery of the fleeing aspect of the Chicken Knife. When I say “Attack!” I expect the party to do just that and not run like Scooby Doo away from danger and to the pizza place. Though not technically a stop along your journey, this vast expanse east of Moore Village is worth noting. In the first world the sands shimmered and undulated making passage frustratingly difficult. Since the earth crystal has shattered the flow of the sands has ceased and you can cross unhindered to the Pyramid at its center. East of the vast desert a mighty tree stretches skyward. The Guardian Tree survived the melding worlds. The ancient tree is not without its secrets as you will soon find out. Ugh I did pick the Brave Blade, and I was correct in doing so, but sadly, it's attack is 5 points lower :( only 145, they a hex numloc to set the flee bit to zero? You can use rapid-fire for the chicken knife. This way, you can't flee. Um, because you fled battles over 150 times in the course of the game?